The Experimantal Television Center is located in Owego, in scenic central New York State. Below are some local resources and places you might find of interest during your stay at the Center. Chamber of Commerce - A good source of information about the surrounding area. You are about 20 miles from Ithaca and Binghamton. 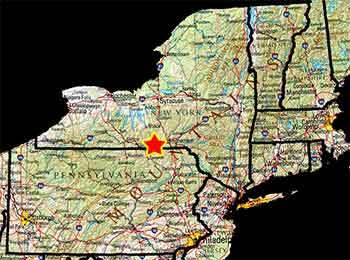 Owego is in the central Southern Tier of the State, about 200 miles from both New York and Buffalo and about 25 miles from both Binghamton and Ithaca. Owego is located off exit 64 on Route 17. 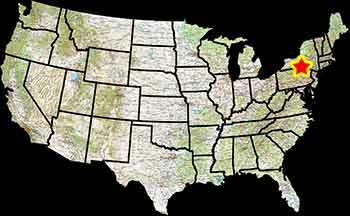 There are numerous towns in the State with names similar to Owego, such as Oswego and Otego. Be sure you have the correct destination. Shortline Bus goes directly to Owego from Port Authority in NYC. Greyhound Bus Lines serves Binghamton and Ithaca Connection in Binghamton to Shortline Bus service to Owego; terminals are next door to each other. The bus station in Owego is about 1/4 mile from the Center. There are local taxis. The regional airport is Greater Binghamton Airport. It is about 30 miles from Owego. There is cab service from the Broome County Airport to Owego. You might consider flying into the international airports in Syracuse or New York City, and connecting with a bus. There is no train service to this area. The nearest passenger trains are in Syracuse. 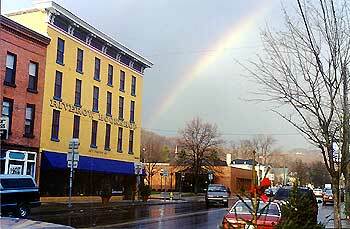 The Treadway Inn - 607 687-4500 located near a plaza about 1 mile from the downtown area.